Azolla is a free floating pterophyte. There are six species of genus Azolla. 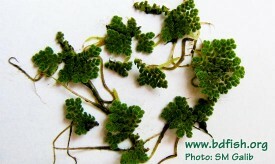 Off them, only one Azolla pinnata is found in various water bodies of Bangladesh. They are unattached and float with their leaves with above the water surface and roots under the water. It is native to much of Africa, Asia from China to Japan, India and the Philippines, and parts of Australia (Wikipedia, 2012). Morphology: Body is small but can be divided into roots, stems and leaves. They are small, soft and branched floating aquatic vegetation. Roots contain root pockets. Sometimes they covers all the surface of the body of water and appeared reddish. Anabaena azollae occupied the cavity at the leaves of azolla and helps in fixating atmospheric nitrogen (Khan and Islam, 2000). Habitats: Grows in closed or semi-closed freshwater water bodies like beels, ponds, lakes, rice fields etc. Azolla grown in the canal and adjacent water bodies near aquaculture farms (Pillay, 1990). Importance: Directly used as food for many herbivorous fishes e.g. grass carp and turtles. Small freshwater turtles observed to consume it under experimental condition in aquariums. Azolla based aquaculture is not a new one and recognized one of the low cost aquaculture techniques (Grover et al, 2000). It played the role of primary producers and source of carbohydrate in an aquatic ecosystem (Rahman et al, 2007). Khan AA and Islam T (2000) Degree Botany Part I, Ideal Library, Dhaka, Bangladesh, pp. 475-479 (in Bengali). Pillay TVR (1990) Aquaculture Principles and Practices, Fishing New Books, Blackwell Science Ltd., p. 529. Rahman AHMM, Islam AKMR, Naderuzzaman ATM, Hossain MD and Afza R (2007) Studies on the Aquatic Angiosperms of the Rajshahi University Campus, Research Journal of Agriculture and Biological Sciences, 3(5): 474-480. Visited 1,707 times, 1 visits today | Have any fisheries relevant question?